will be performing live very soon..
on december 6th, we will be performing an all-new live PA for [KONTROL] at The EndUp in San Francisco. 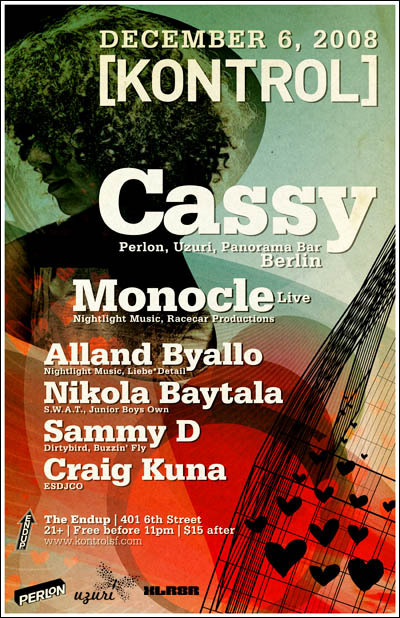 we will be opening up for the wonderful Cassy, so you should definitely not miss this one. we’d love to see you there! Hello, hello- our last show went quite well! Thank you everyone who made it out on that Tuesday! We have been very overwhelmed with everybody’s support for our music and are honored to be a part of the San Francisco techno scene. Again we are providing a recording of our set, which is available here (Save As…). Be on the lookout for new releases from Monocle coming soon, including new tracks from both of our respective solo efforts, Anitserk and Coupler (site coming soon). See you all at [KONTROL] this weekend! This is the beginning of our new blog for all things Monocle related. In honor of our wonderful new site, we have provided a recording of us performing live. You can download the file here. Enjoy! design based on fSpring, by fahlstad.